48 in. x 96. in. 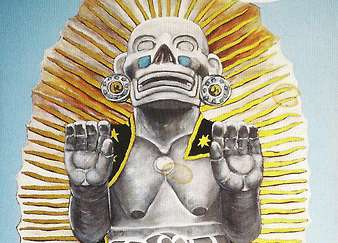 Nuestra Madre (Our Mother) shows a stone statue of Coatlicue, the Aztec mother goddess of fertility and rebirth. Shown with the Virgin of Guadalupe’s bright halo of sunrays and cosmic cloak of stars, the statue references the Virgin of Guadalupe’s history; the Mexican saint, a Virgin Mary figure, is thought by many to have been derived from Coatlicue. López says that she sees the Virgin of Guadalupe as only being Christian on the surface, and a Goddess beneath. 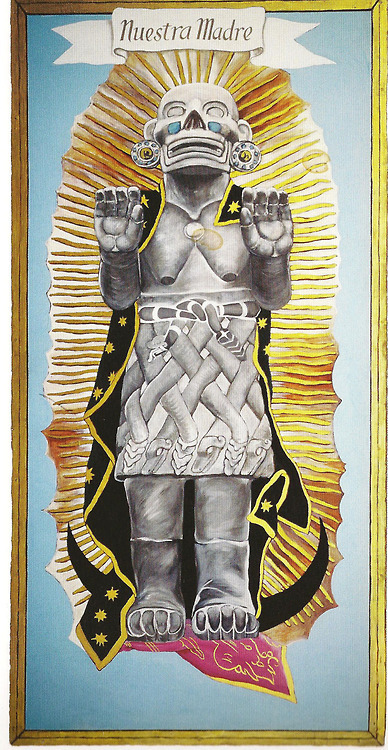 The Virgin of Guadalupe is thus a hybridized figure, a combination of imposed colonial values and indigenous traditions. Nuestra Madre makes this cultural blending explicit by showing the dual and border-crossing power inherent in Guadalupe. The work also reclaims the sexuality and energy that Coatlicue embodied before she was transformed into Guadalupe’s purity and demureness, and reminds the viewer of the strength the Aztec people established long before they were colonized by the Spanish.